Few years ago I bought a dragon head .I have painted the mask n the rest of my body covered in latex .The wings are from another costume.I spray painted the wings and my hunny put stronger screws in the wings.I had a old pair of shoes .I took n painted n used foil to create toes.I added latex for the skin look n used werewolf claws as dragon claws.My fingers as well had claws.I had a tail too .I painted that as well but,bought it green.It was all I could get.The latex paint was the hard part .I still need to work on that . 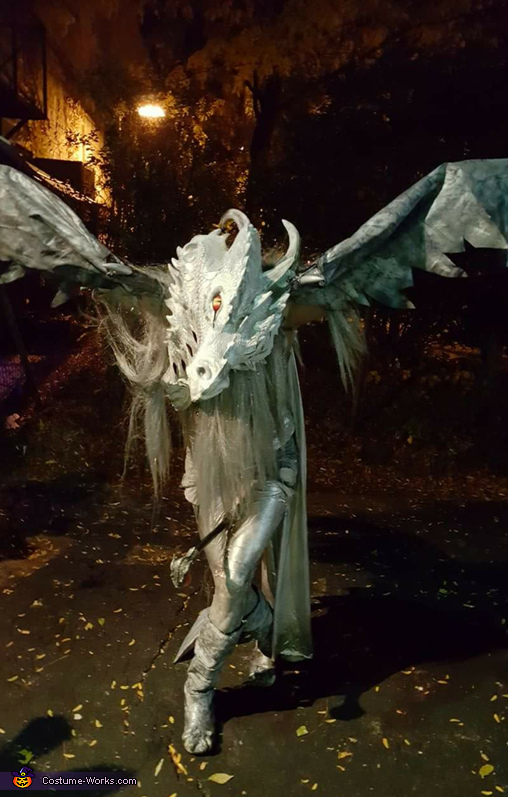 The staff was bought from Spirit of Halloween.I'm very happy that people really enjoyed My Dragon.I got the idea years ago but,turn it into A dragon from the Game Of Thrones atleast I tried too . Love it!! You are very artistic! !